This 3 light vanity highlights frosted glass shades to match transitional dicor. The vanity bar can be mounted up or down to suit your personal style. The fixture is finished in brushed nickel which matches most home styles. Requires 3 - 60 watt medium bulbs. This modern, sleek 3 Light Vanity Fixture is the perfect way to update a bathroom. The stylish Matte White Glass Shades allow the perfect amount of light brighten the room. While the Brushed Nickel finish will easily blend with any dicor. It uses 3 X 60 Watt bulbs. Add radiance to your bathroom with Hampton Bay's 3-Light Bath Bar in Brushed Nickel Finish. With clean brushed nickel finish and charming classic design, this wall mount offers an alternative to a bath ceiling light. Featuring a sophisticated alabaster glass shade, this fixture will provide brilliant focused lighting for your bathroom or bedroom mirror. The Hampton Bay 3-Light Brushed Nickel Vanity Light adds chic style to your bath bar. The fixture provides focused lighting that is ideal for makeup and grooming tasks. The light features a square back plate that allows for mounting to the wall or ceiling, a perfect accent to your décor. Add classic decor to your home with this vanity light. Brushed nickel finish is perfect for any style of home. Frosted marbleized glass shades provide a bright yet subtle light. Opening at bottom allows easy access to replace bulb. Down facing bulb shines brighter light below. 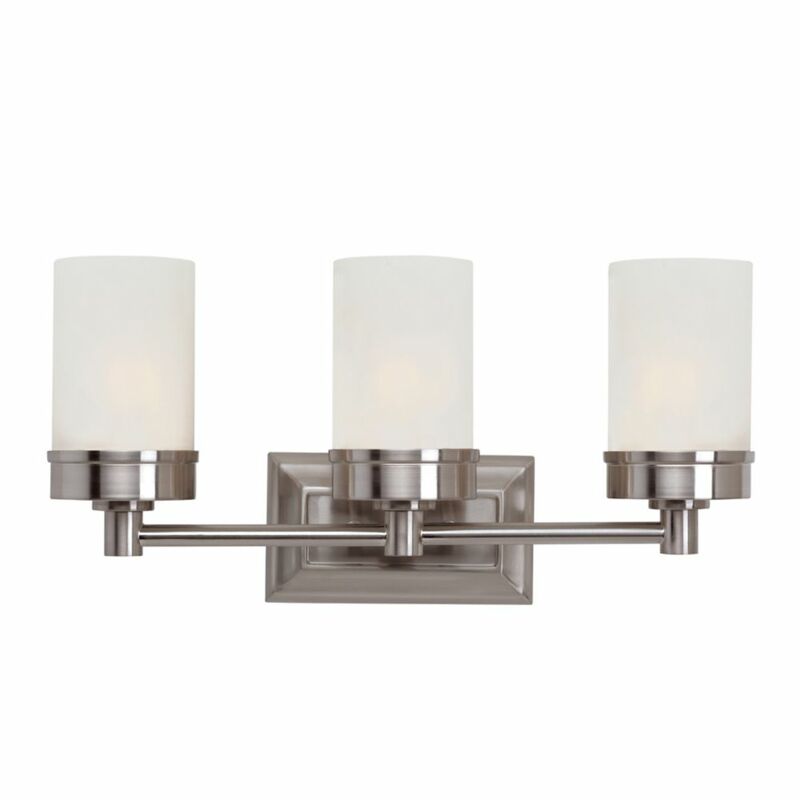 3- Light Brushed Nickel Vanity Light This 3 light vanity highlights frosted glass shades to match transitional dicor. The vanity bar can be mounted up or down to suit your personal style. The fixture is finished in brushed nickel which matches most home styles. 3- Light Brushed Nickel Vanity Light is rated 5.0 out of 5 by 1. Rated 5 out of 5 by Powderroomreno from Beautiful light This is a beautiful classic light. Delivery was exceptional.